Last Wednesday we told you about Nick at Nite making schedule changes and the highlight was Friends' two-hour block being split to 9-10pm and 11pm-12am, well effective yesterday Nick at Nite has changed their schedule again. The most notable change for this schedule is the return of My Wife & Kids to primetime. The Damon Wayans comedy will air in the 8-9pm hour once again, replacing That '70s Show, which will move to the 10pm hour. George Lopez was airing in the 10pm hour and that will move back to the 9pm hour. So yes that means Friends is back to airing in a two-hour block from 11pm-1am every night. I'll be there for you! The 12am hour was That '70s Show encore, but will shift to the 1am hour now, bumping off The Nanny. That comedy will remain at 5am (and in late night on sister network TV Land). In fact, everything from 2am-7am will remain the same it was before this change happened. One other Nick at Nite note, on President's Day (Monday, Feb. 20) they will air a marathon of Friends immediately following the premiere of the Nickelodeon original series premiere Fred: The Show at 8pm. The Friends marathon will run from 8:30pm-3:30am. Stay with us for any further Nick at Nite updates. We will also have some news in the coming days on TV Land April 2012 with two series returning from hiatus (well, sort of). Stay tuned. For the week of February 20-24, 2012, we have many current sitcom stars and past sitcom stars on TV talk shows! All times listed are Eastern. So get your DVR's (or whatever you use) ready! Ready? Here is all what you need to know for the coming week! Jesse Tyler Ferguson (Modern Family/The Class) - Watch Jesse on The Late Show with David Letterman at 11:35pm on CBS. Whitney Cummings (Whitney) - Whitney drops by Chelsea Lately on E! at 11pm. Jon Cryer (Two and a Half Men) - Jon visits LIVE! with Kelly, so check your listings. Janet Jackson (Good Times/Diff'rent Strokes) - Janet is a guest on Anderson, so check your listings. Jennifer Aniston (Friends) - Jennifer appears on ABC's Good Morning America between 7-9am. Eric Stonestreet (Modern Family) - Eric stops by Jimmy Kimmel Live! at 12am on ABC. David Alan Grier (Life with Bonnie/DAG/Damon) - David visits Late Night with Jimmy Fallon at 12:37am on NBC. Jennifer Aniston (Friends) - Jennifer is a guest on Chelsea Lately on E! at 11pm. Jesse Tyler Ferguson (Modern Family/The Class) - Jesse appears on ABC's Good Morning America between 7-9am and then guest co-hosts The View on ABC at 11am ET/10am CT-PT. Regina King (227) - Regina joins the Chew Crew on The Chew on ABC at 1pm ET/12pm PT/CT. Tim Allen (Last Man Standing/Home Improvement) - Watch Tim on The Tonight Show with Jay Leno at 11:35pm on NBC. John Witherspoon (The Wayans Bros./The Tracy Morgan Show) - John is a guest on The Late Show with David Letterman at 11:35pm on CBS. Alan Alda (M*A*S*H) - Alan visits Late Night with Jimmy Fallon at 12:37am on NBC. Jennifer Aniston (Friends) - Jennifer appears on Conan at 11pm on TBS. Patricia Heaton (The Middle/Everybody Loves Raymond) - Tune in to see Patricia on LIVE! with Kelly, so check your listings. Tia (The Game/Sister, Sister) and Tamera Mowry (True Colors/Roommates/Sister, Sister) - Tia and Tamera sit down with Tim Gunn to discuss marriage, babies, hair and the upcoming season of their reality show, Tia & Tamera, on ABC's The Revolution at 2pm ET/1pm PT. Jesse Tyler Ferguson (Modern Family/The Class) - Jesse joins the Chew Crew on The Chew on ABC at 1pm ET/12pm PT/CT. 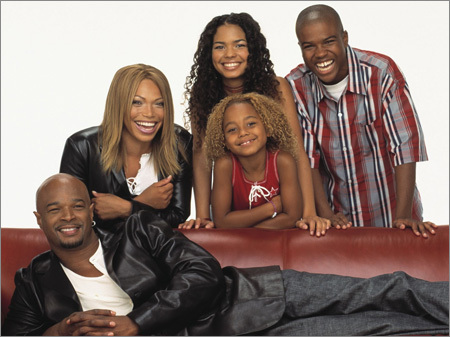 David Alan Grier (Life with Bonnie/DAG/Damon) - David stops by The Wendy Williams Show at 12am on BET or on your local stations. Rico Rodriguez (Modern Family) - Catch the young and talented Rico on LIVE! with Kelly, so check your listings. Jennifer Aniston (Friends) - Jennifer continues to make the rounds on The Ellen DeGeneres Show, so check listings. Phylicia Rashad (The Cosby Show/Cosby) - Phylicia tells us about her new Tyler Perry film, Good Deeds, on The Wendy Williams Show at 12am on BET or on your local stations. Jennifer Aniston (Friends) - Watch Jennifer on The Tonight Show with Jay Leno at 11:35pm on NBC.